It's IndyCar Sunday and the final day of Honda Indy Toronto 2018. 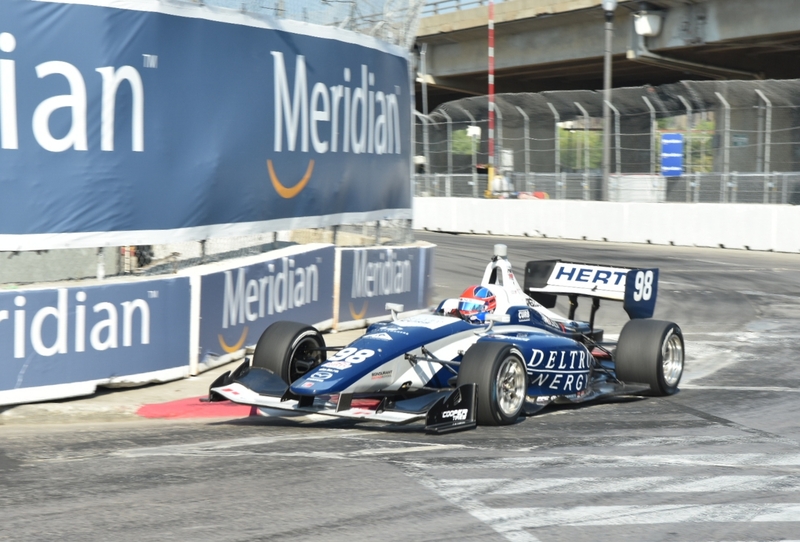 All series but Indy Lights have completed qualifications so today is almost all races on the track. 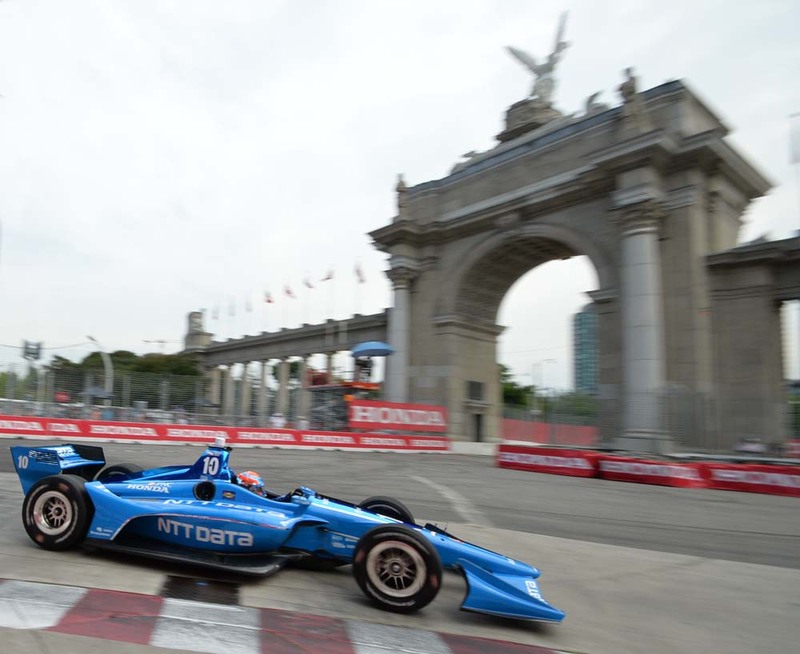 Update: Scott Dixon wins his third Honda Indy Toronto race with his victory on Sunday, July 15, 2018. 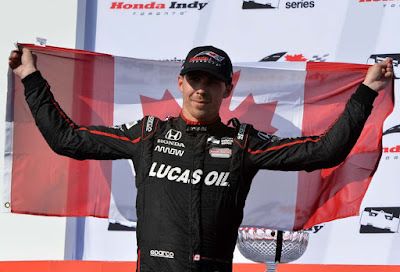 This ties Scott with Will Power for number of wins in Toronto. 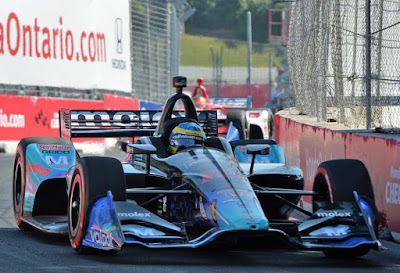 IndyCar is an Indianapolis based governing body for both the Verizon IndyCar Series and the Mazda Road to Indy Series. 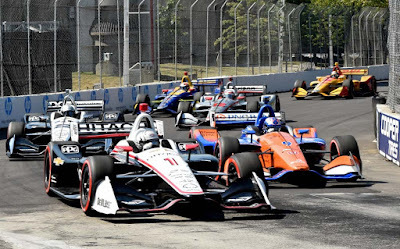 The Road to Indy has the Indy Lights, Pro Mazda and USF2000 Championship which hopefully lead a driver to the premier series Verizon IndyCar. 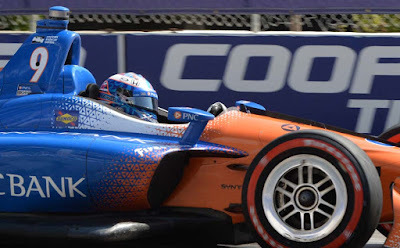 In the IndyCar the cars use a Chevrolet twin-turbocharged V-6 or a Honda twin-turbocharged V-6 IndyCar Series engine and all use the IR-12 chassis built by Dallara Automobili and fuel up with Sunoco E85 which is 85% ethanol and 15% racing gasoline. 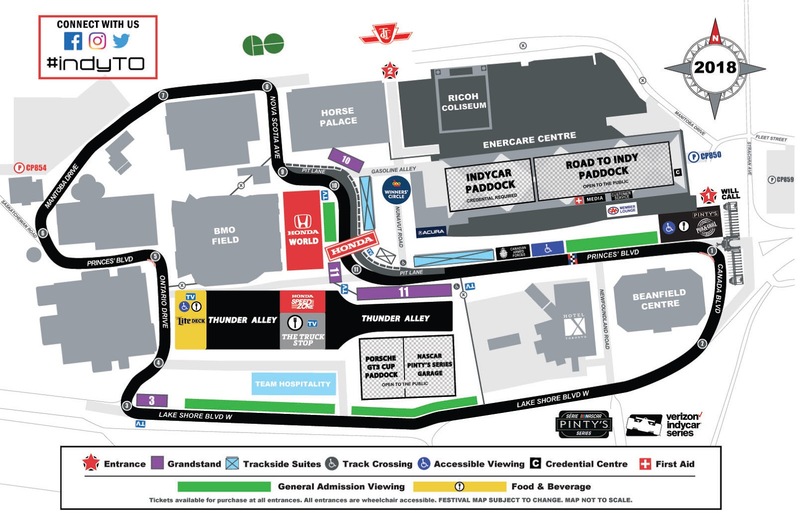 The start/finish line is directly opposite the Enercare Centre in about the middle of Princes' Boulevard, the course is driven clockwise with the Turn 1 at Princes' Gate, leading down onto Lake Shore Boulevard. The cars re-enter Exhibition Place at Turn 3 on Ontario Drive. 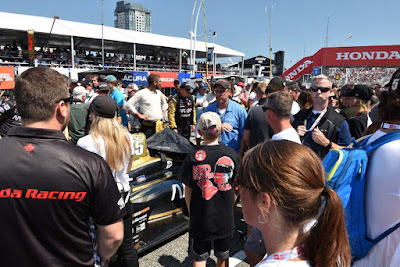 USF2000 race 2 is at 9:45am, Pro Mazda race 2 is at 10:40am, Indy Lights race 2 is at 12:25pm, GT3 race 2 is at 1:40pm and the headline IndyCar race green flags at 3:42pm. 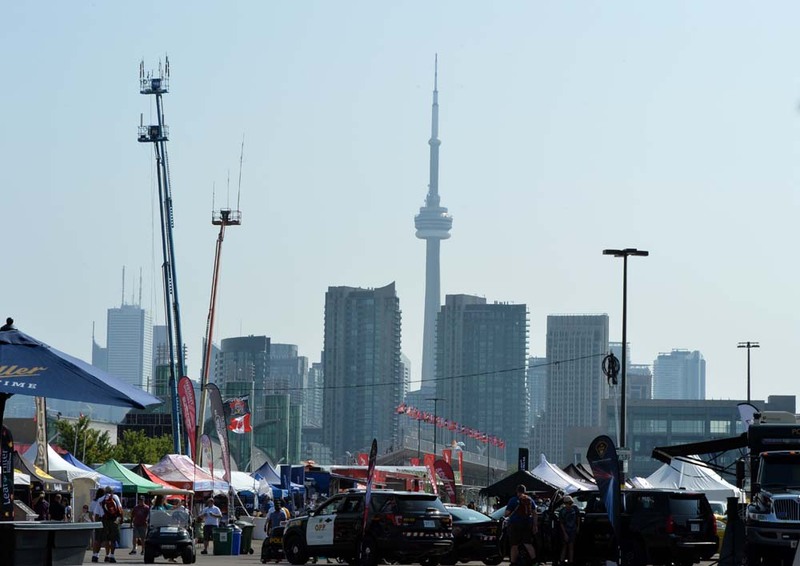 The Seaway Pools n Tubs ladies in bikinis have the right idea as Toronto and the GTA are under a Heat Warning today. Sunscreen and beverages are very important today. 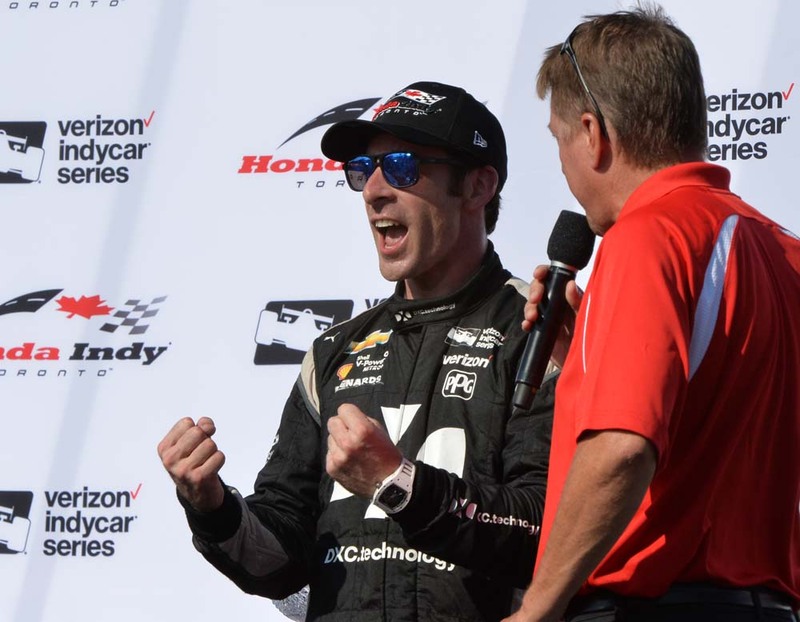 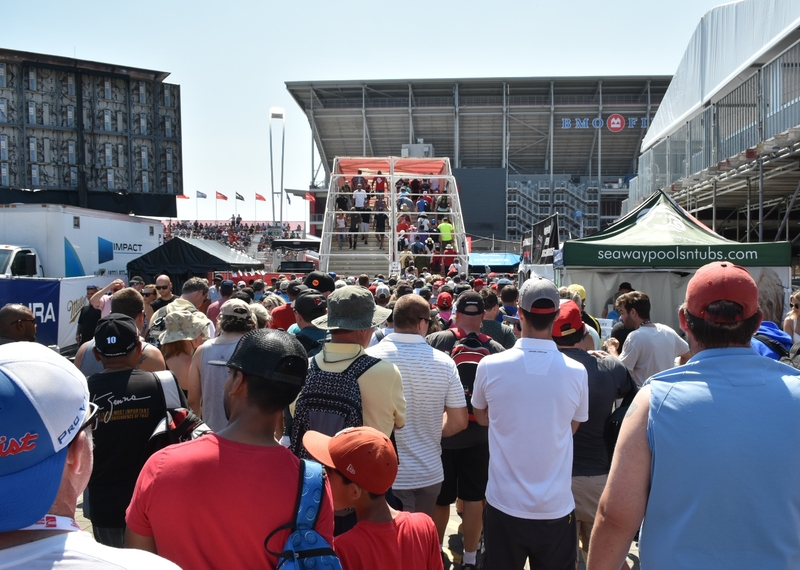 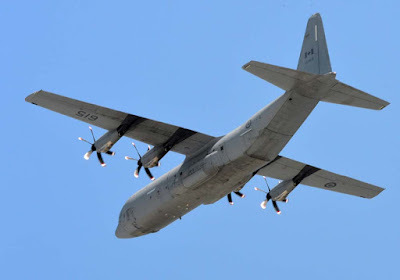 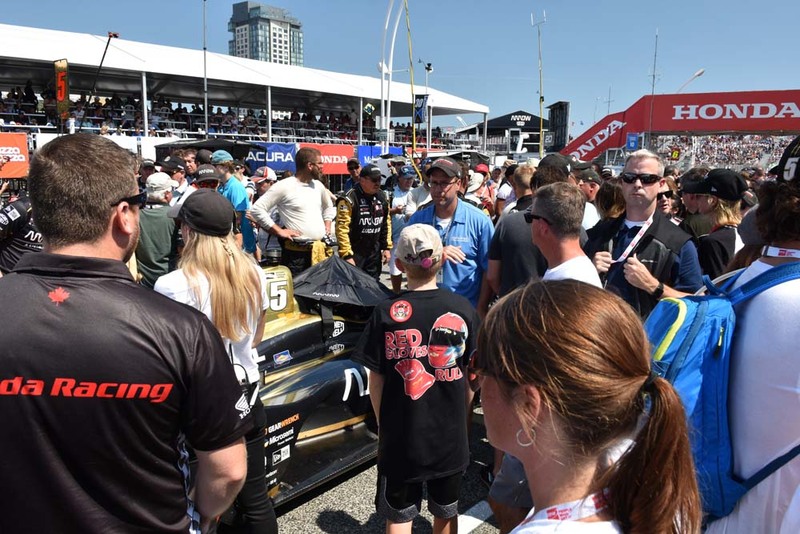 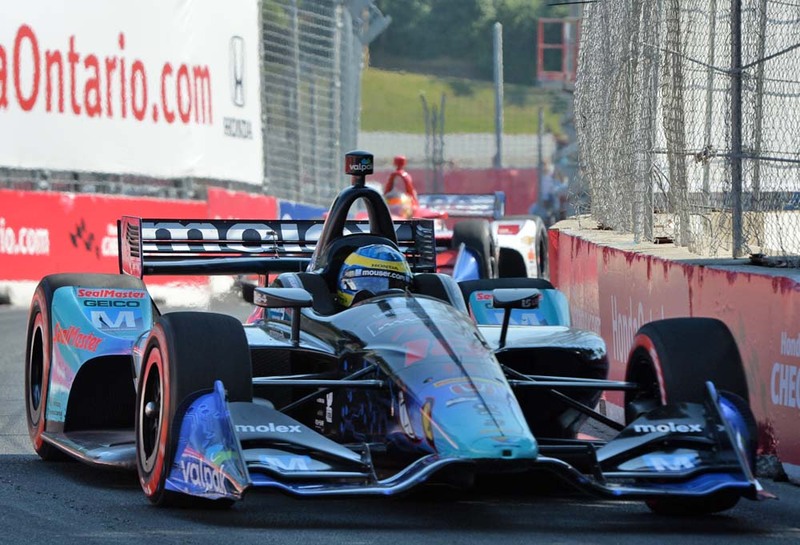 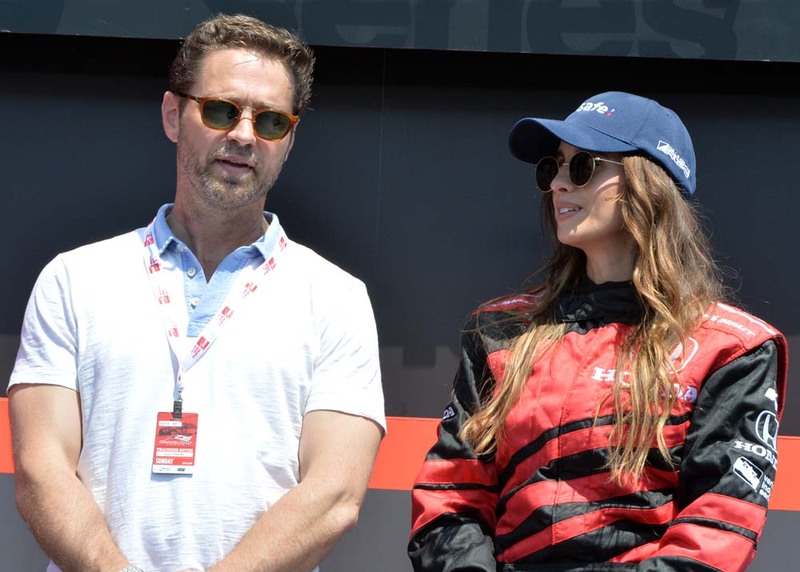 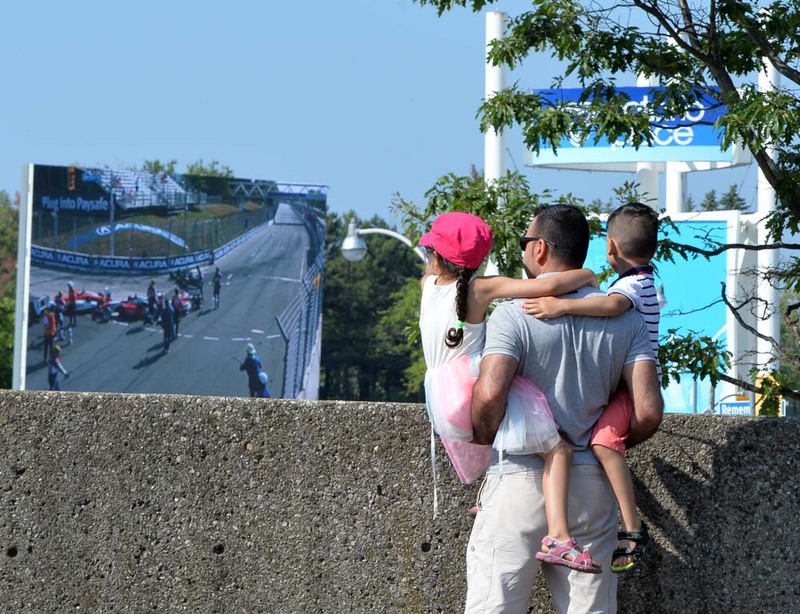 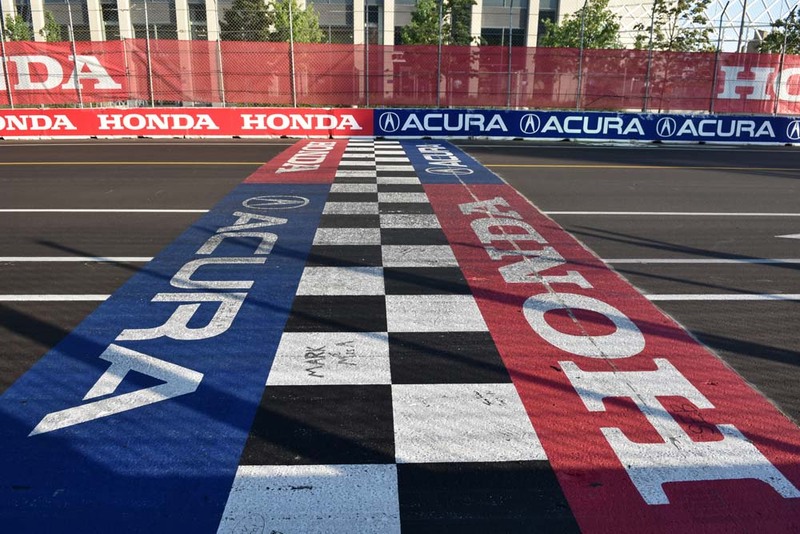 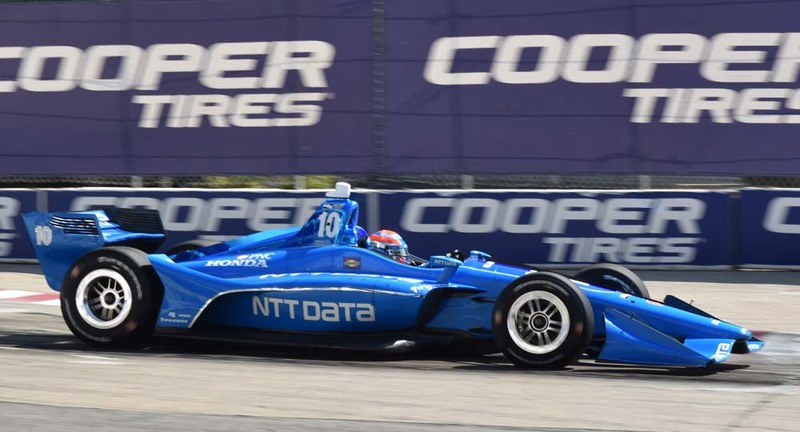 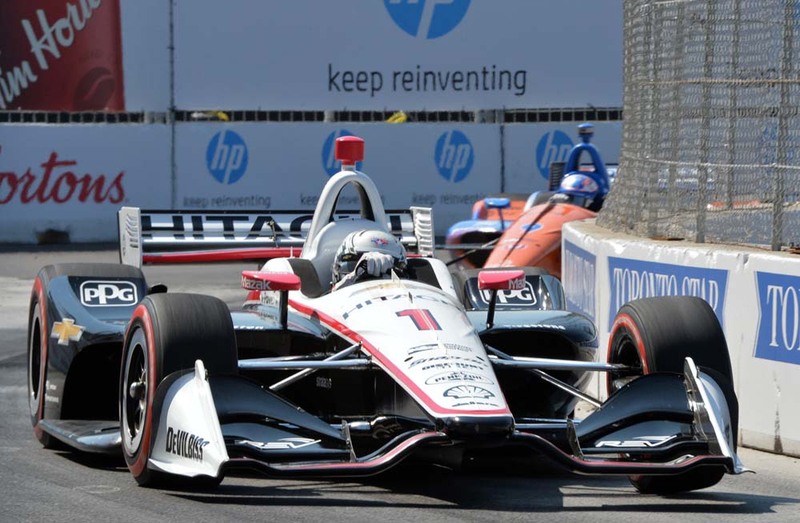 Events leading up to the 34th Toronto IndyCar racing include; 2:45pm cars pushed out, 2:50pm cars to grid, 2:57pm driver introductions in Victory Circle and the first national anthem at 3:26pm. 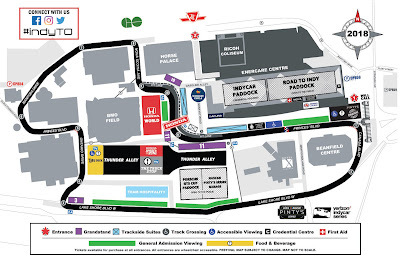 The race will be 85 laps (151.81 miles) and last until about 5:45pm. 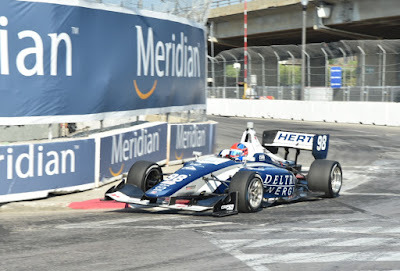 Drivers can use the push-to-pass for up to 200 seconds with a maximum 20 seconds per use. 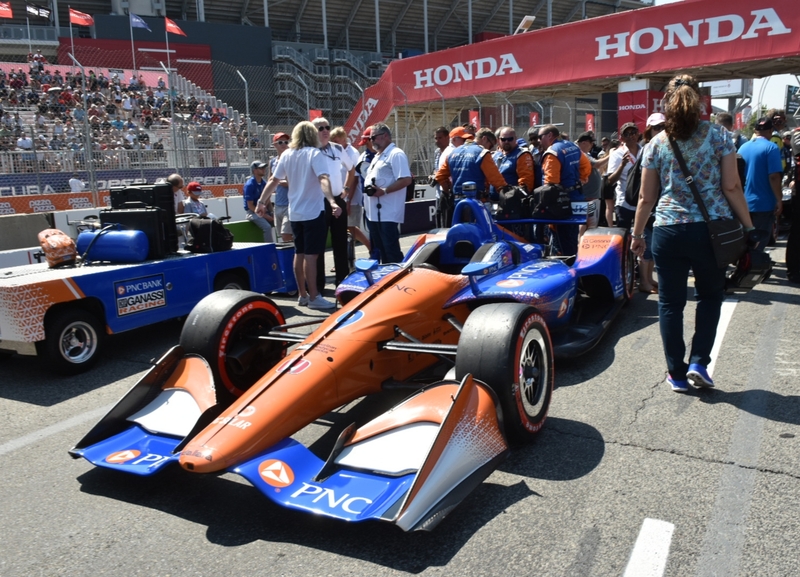 Teams have seven sets of primary tires and four sets of alternate tires - they have to use one set of each in every race. 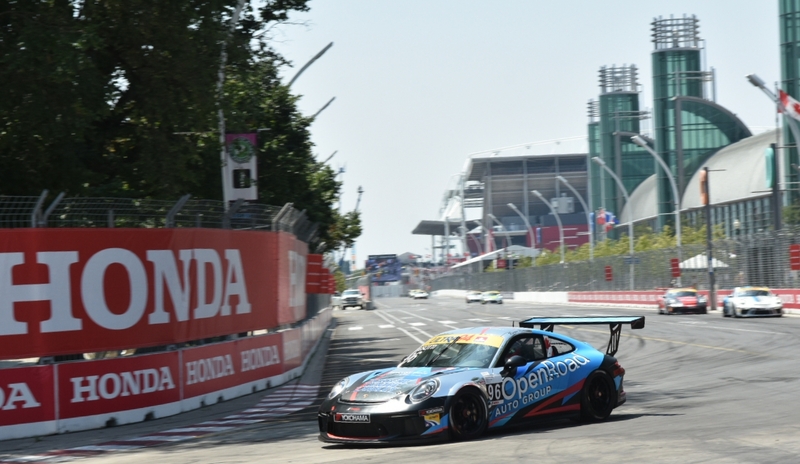 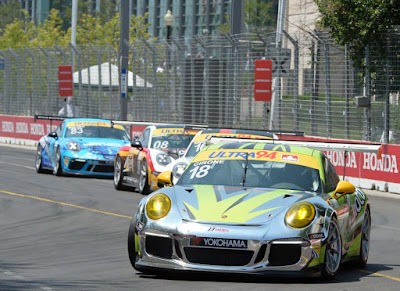 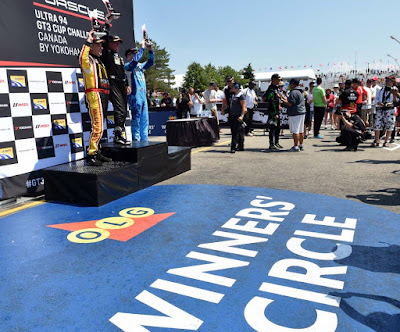 A lot of drivers like to race in Toronto - they like the street course layout, the fans and support that they see during the event but most dislike the changes to the track surface - from new asphalt to smooth concrete and back again. 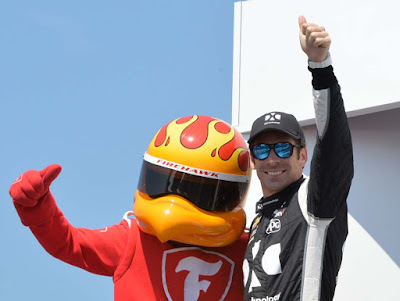 Simon Pagenaud says that the bumpiness favours good drivers who can setup their cars to try to get as much advantage as possible in the race. Josef Newgarden has the pole position in today's race and won last year's race so keep an eye on the #1 car to go back to back in 2018. 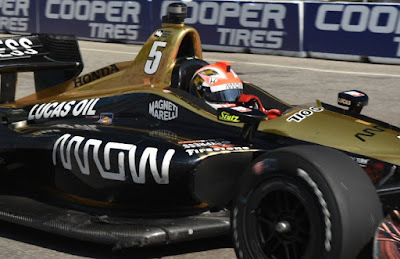 Canadian James Hinchcliffe in the #5 car is a local favourite to improve his 2017 podium finish and take the checkered flag, especially after winning the last IndyCar race. Six rookies are in today's race including Canadian driver Robert Wickens from Guelph, Ontario. 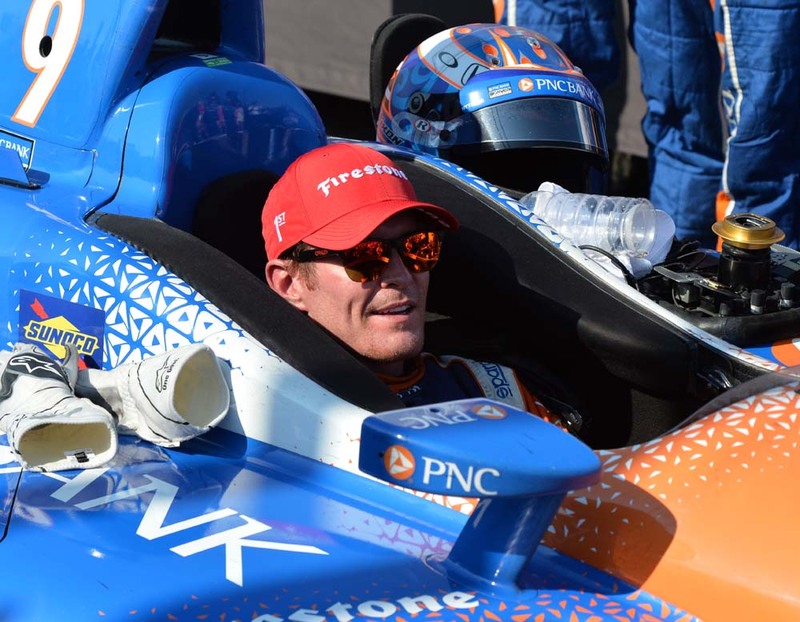 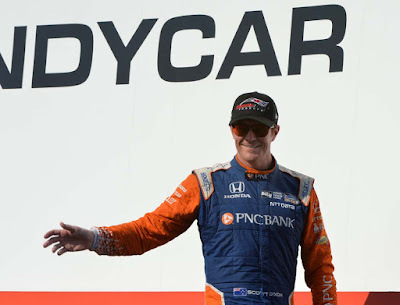 Coming into this race Scott Dixon (411 pts) is the current 2018 season points leader followed by Josef Newgarden (378 pts) and Alexander Rossi (370 pts). 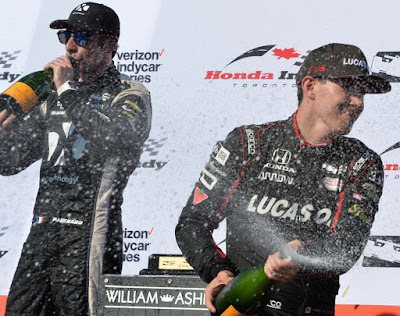 Winners of the Toronto race have taken the overall Series Championship in 5 of the last 9 years. 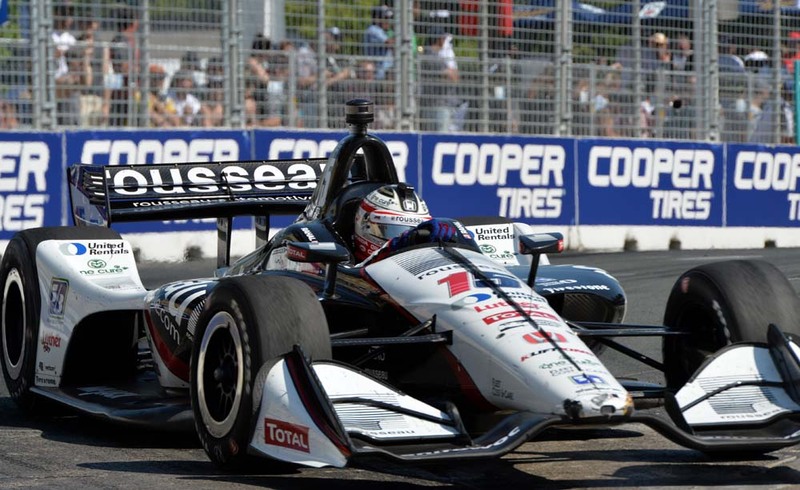 The starting lineup top 5 is Josef Newgarden #1, Scott Dixon #9 who won both Toronto races in 2013, Simon Pagenaud #22 who won the 2017 Toronto P1 award, Will Power #12 and Alexander Rossi #27. 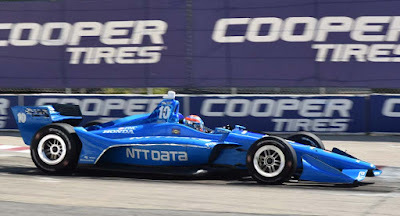 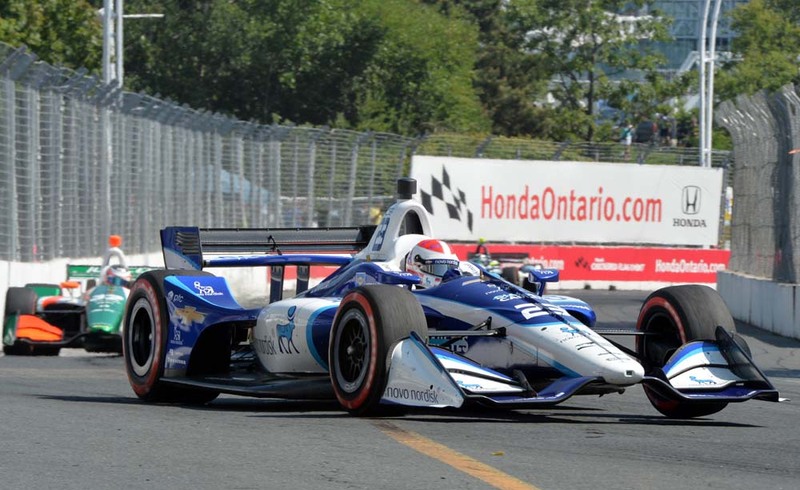 From the Honda Indy Toronto Pole sitter Newgarden, the reigning Verizon IndyCar Series champion and defending winner at Toronto, led 25 early laps in the No. 1 Hitachi Team Penske, but brushed the wall exiting Turn 11 on a Lap 33 restart and finished ninth. 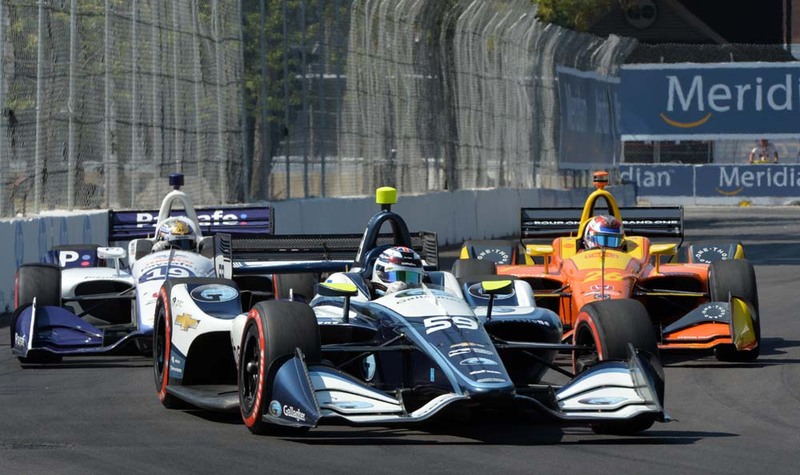 "It was a tough race," Newgarden said. 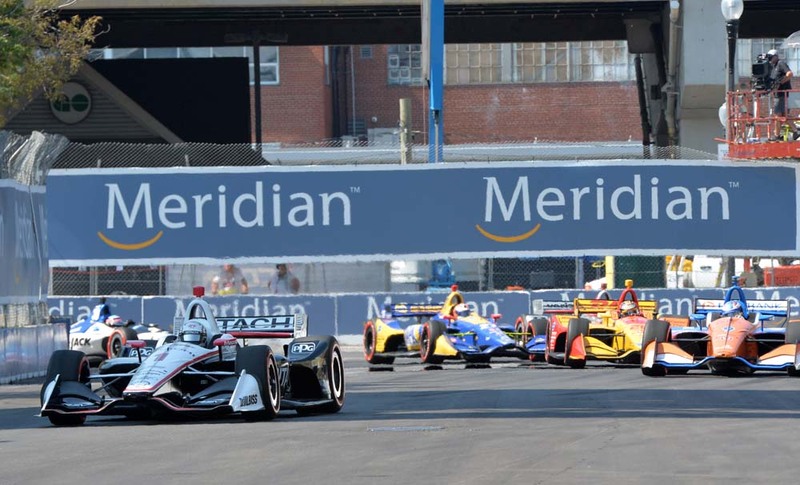 "Making contact with the wall didn't help. 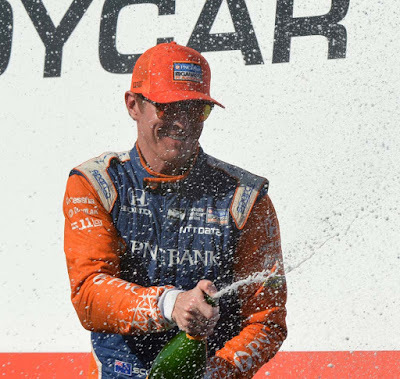 I don't know what it was, to be honest with you, it was either marbles or dust from the sweepers. 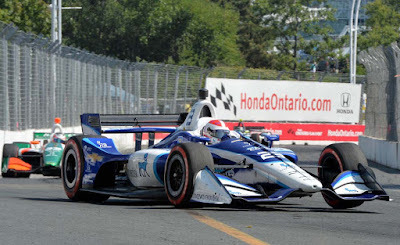 I went straight into the wall and part of that is my fault, just making a mistake. 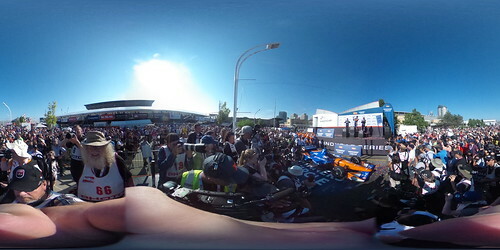 But I didn't expect it." Dixon admitted that Newgarden's miscue was the key to the race. 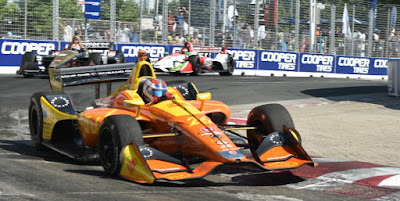 "That's where our race was won today, was through the bad luck or bad situation that Josef had," said Dixon, whose win gave engine manufacturer Honda a sweep of the five temporary street-course races this season. "We just needed some clear air, and (after passing Newgarden) we were able to check out." 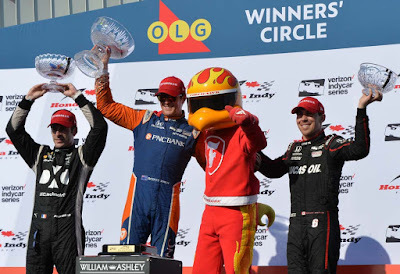 left to right;, Simon Pagenaud #22 car second, Scott Dixon #9 car first and Robert Wickens #6 car third. 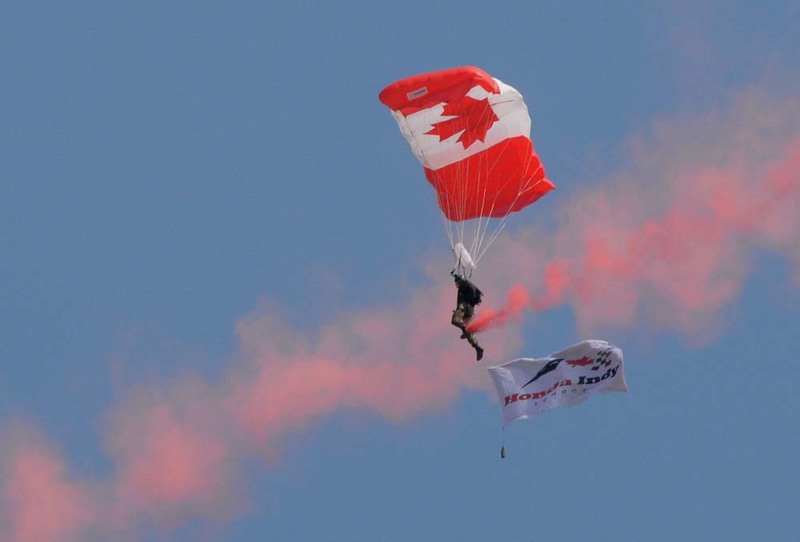 See more photos of Sunday's racing after the jump.